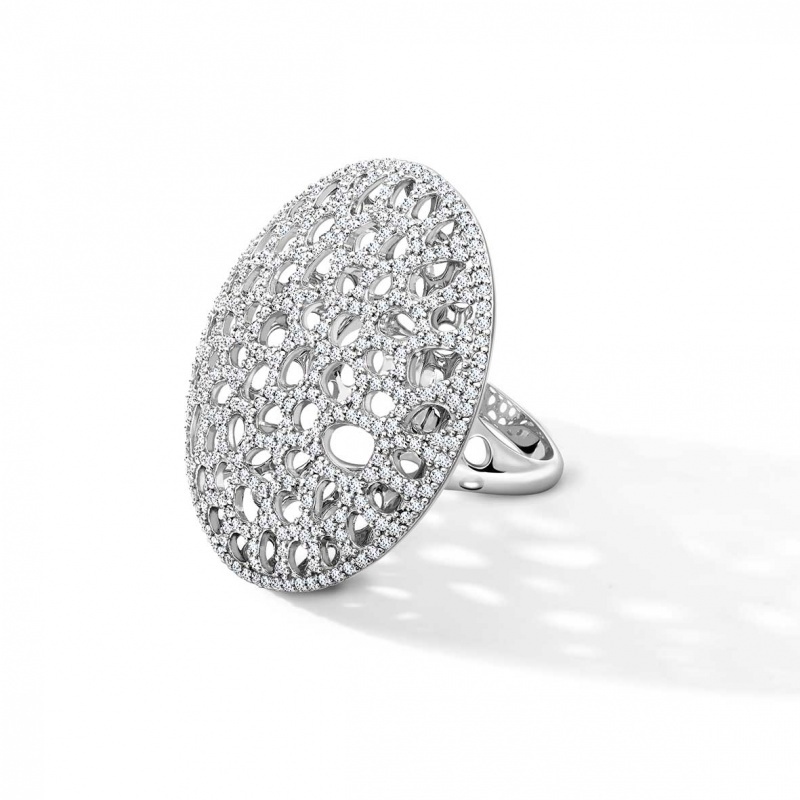 This ring with over 340 zirconia gemstones individually and intricately set into the signature latticework from Rachel Galley is one of the most exquisite pieces you will ever see. Measures 40mm diameter across the circular top piece and has graduated latticework shank. Each piece of Rachel Galley Jewellery will arrive in a beautiful bespoke box and gift bag. All orders are sent by complimentary Special Delivery. If you have an urgent delivery deadline please make sure you contact info@rachelgalley.com to check for availability before purchasing. If the item you have ordered is not available then we can offer you a refund or an alternative item of equal value. Differences in value will be refunded or charged accordingly. All orders placed on the website include complimentary Special Delivery postage & packing within the UK. If you require your package to be sent outside the UK then additional postage fees may apply and we can quote delivery charges upon receipt of your order. It is important that the addresses supplied by you to us are accurate and you are responsible for making arrangements to receive the goods and if necessary collecting the goods from the local sorting office should you be out at the time of delivery, which you should do as quickly as possible. If you fail to collect the packet it will be returned to us and there may be additional charges to re-send it to you. Rachel Galley Jewellery bought from stockists is covered by the returns policy of the stockist to whom all matters on faults, returns, and exchanges should be referred. Items supplied direct by Rachel Galley Jewellery Design LTD have a security tag; once this is removed the item is no longer refundable unless there is a clear manufacturing fault. For hygiene reasons we cannot exchange or refund earrings, unless there is a clear manufacturing fault. Items must be returned within 14 days in the original condition, packaging and still with the security tag then you can receive a full refund or exchange. Refunds are exclusive of the P&P cost of £6 per parcel. Sale items are non-refundable. In the event that you wish to return a sale item, you will be issued a credit note. To make a return from a purchase made from our website or from Rachel in person, please write on the back of your delivery note, giving the reason for the return. If you wish to exchange your item due to personal preference then please follow the instructions to return an item and make sure you include all paperwork and contact information. You may want to place an order for your desired item through the website and claim a refund for the item you no longer want, this may be quicker. Refunds are exclusive of the P&P cost of approximately £6 per parcel. If you think you have made an error on your order and need to make a change to it or make a cancellation then please do get in touch as soon as possible as we normally post our stock items within one working day of order. You can email info@rachelgalley.com and we will get back to you as soon as possible. You can contact info@rachelgalley.com for more returns enquiries. Site built by James Galley, a web developer based in Manchester.